Days getting longer, the sun a little stronger. Yes, still it is pretty cold at many places. But inevitably, as the sun comes up higher on the horizon, the ground is unfreezing in many places for part of the day at least. With the longer day light, the hooves of our horses are starting to grow more rapidly. During the winter months, hoof growth had slowed to a crawl, often in a 6 week period one had to use the rasp only for a couple of strokes. So it comes sometimes as a surprise what one can find when hoof growth accelerate and the nippers get used again. Most often encountered in early spring: blood in the white line, especially in the quarters. 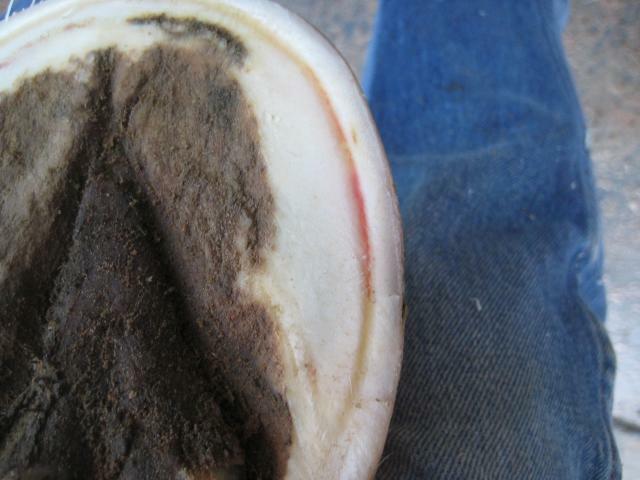 While blood in the white line can be observed all year long around the dorsal aspects of the hoof, I noticed that the quarters are mostly affected by it during the winter. 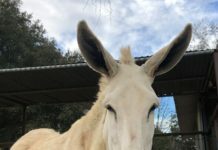 Dorsally one might see blood in the white line when a horse lands toe first or just by banging the dorsal hoof wall against rocks or stable doors. If the white line is stretched as well and displays redness, we could suspect too long a toe. But why at the quarters? We see no stretched laminae and the horse normally does not bang the hoof side ways against obstacles. I reckon that this happens through travel for weeks on end over icy frozen ground and the subsequent concussion shows up in the quarters. Maybe this side was a little too high? At any rate, I hardly ever encounter this throughout the rest of the year, only early spring. Interesting, though, the horses displaying this condition are never lame. Another surprise can be thrush. Most often observed when the ground is wet. Bacterias thrive on wetness and manure. Again, late winter and early spring are the times when we have to watch out for Thrush the most. 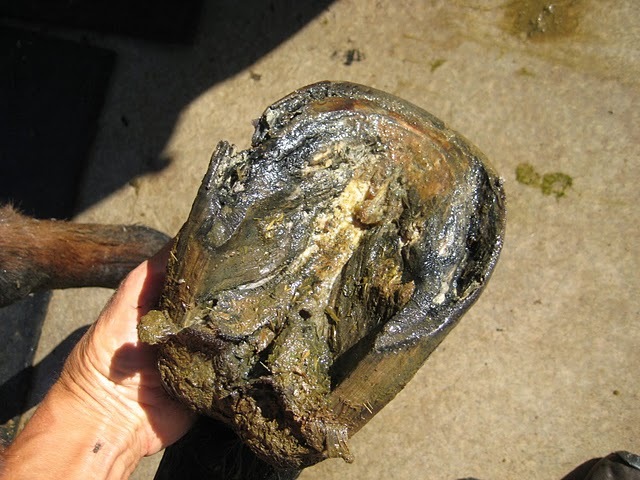 The horse who owns this neglected hoof was brought to me for treatment. 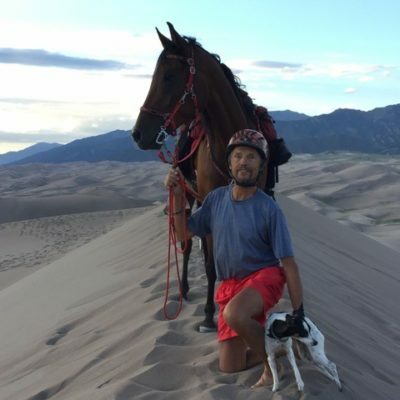 The horse was severely lame. I suspected the worst. After initial trimming and cleaning, it displayed thrush that had entered the digital cushion, the reddish color is blood. Natural horse care and natural hoof care were missing here. After thoroughly cleaning and trimming this horse, I applied Hypozin, a product I had written a blog about at the Global Endurance Training Center blog last week, applied then an Easyboot Glove, so it can get removed and the hoof checked and retreated on a daily basis. 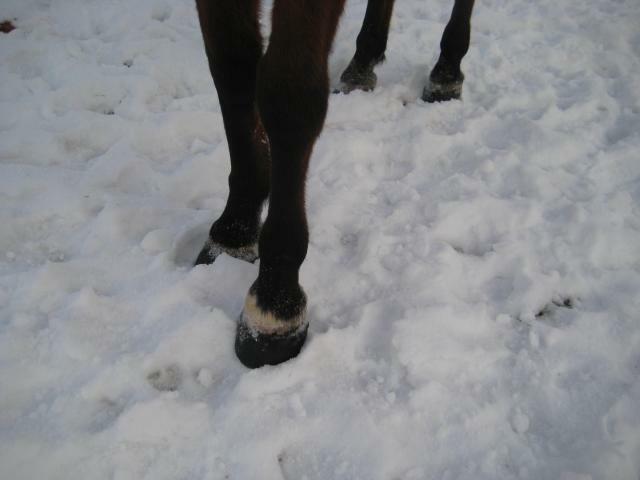 One could also use an Easyboot Rx and soak the hoof with either epsom salt, or, what also works well, a sugar solution. Both solutions disinfect and kill bacteria. Some people use diluted bleach, but it is really harsh and kills live tissue as well. I do not recommend it. After soaking the hoof, apply products like Hypozin or The Sauce. 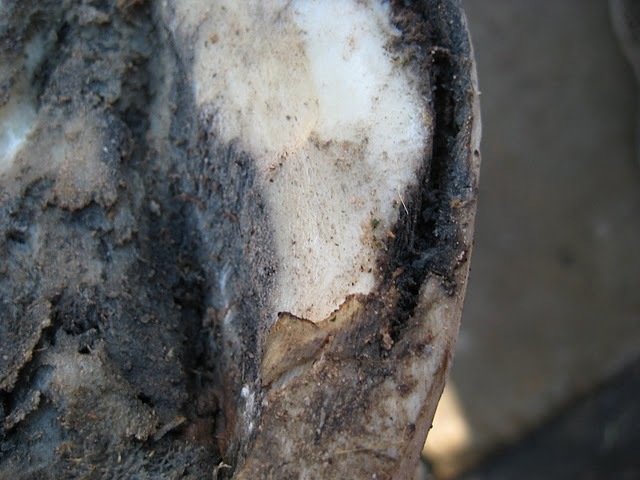 Within 3 days of taking care of the thrush infection, often the hoof is on the mend. In more severe cases, continue the treatment till it is cleared up. The above case was extreme. But how do you recognize any thrush, even mild cases? Thrush affects mainly the frog, the central sulcus and collateral grooves are mostly affected first. One can observe a puss-like discharge (with a strange foul smelling odor), often black in nature. In extreme cases, bleeding can occur as well. 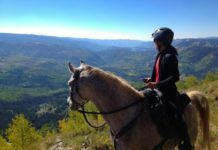 The affected area might be sensitive to pressure, your thumb or hoof testers. Important to recognize it and take preemptive measures, even if you are not absolute sure it is thrush. 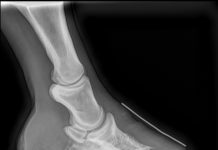 Follow the treatment outlined above, and/or consult a veterinarian or hoof care specialist. White line disease, on the other hand, affects more the white line and eats away at the laminae. Again, bacterias and fungi can be the cause, but it often is also caused or worsened by unbalanced trims. Treatment is good and necessary, but eliminating the cause is better. Here is an example of a severe white line ailment. Applying a solution like iodine, White Lightning, Hypozin or The Sauce from Sore No More. Applying natural hoof trimming. It would be helpful to bevel the hoof wall considerably. I had seen very good results with white line disease and thrush when using Easyboot Gloves or Easyboot Glue-Ons in conjunction with treatment. It is of utmost importance that the hoof is thoroughly cleaned, disinfected and treated before applying the boots. The advantage is that no further dirt can enter then the affected area and your applied medication can actually do its work without interference from new bacteria. Yes, the oxygen part is missing, however, when horses are standing in mud and manure, there is no oxygen available anyway. So a much better solution is to have a hoof encased in a protective horse boot to allow the medication to work. 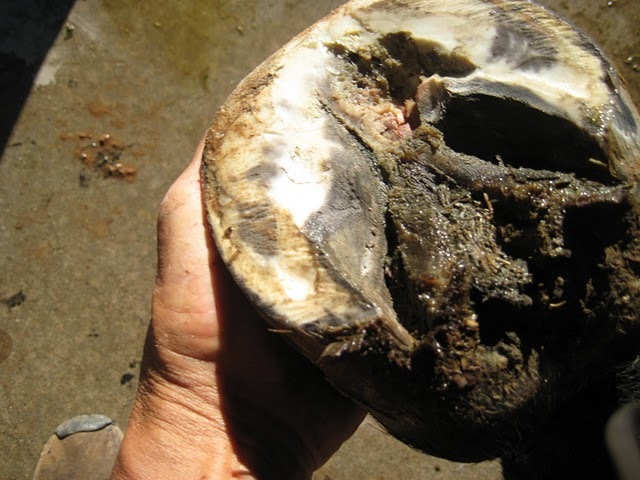 Horse hoof problems can and will occur, but with proper attention to the hooves we can minimize the damage and solve the problem quickly. The various boots from EasyCare are certainly a valuable ally in combating hoof problems and hoof diseases. 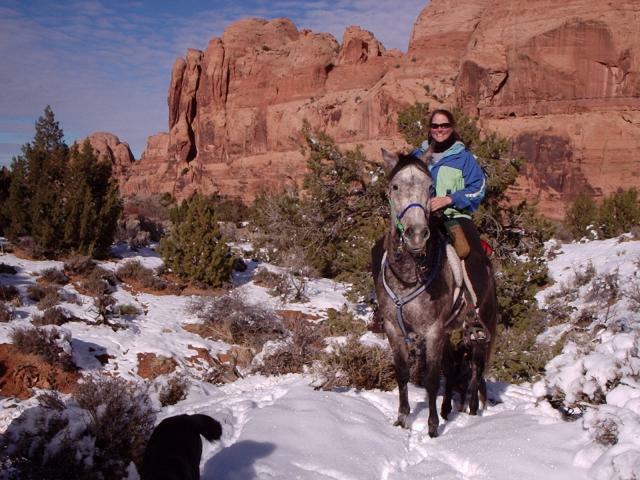 Late winter ride with DWA Powerball in Arches Park, Moab. 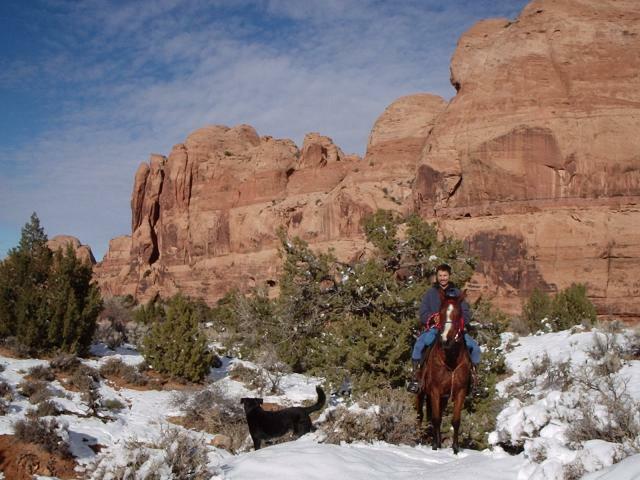 Horse is wearing Easyboot Gloves. Happy riding, spring is just around the corner.